Just recently we shared the teasing news that Alone In The Dark is making another comeback, which raised our eyebrows considering the Wii release of dubious quality and the general panning that the last rebirth of the franchise endured on multiple platforms. Atari, now a new, fairly small-scale company, had confirmed that it wasn't deterred and that a new title was to be revealed at PAX. 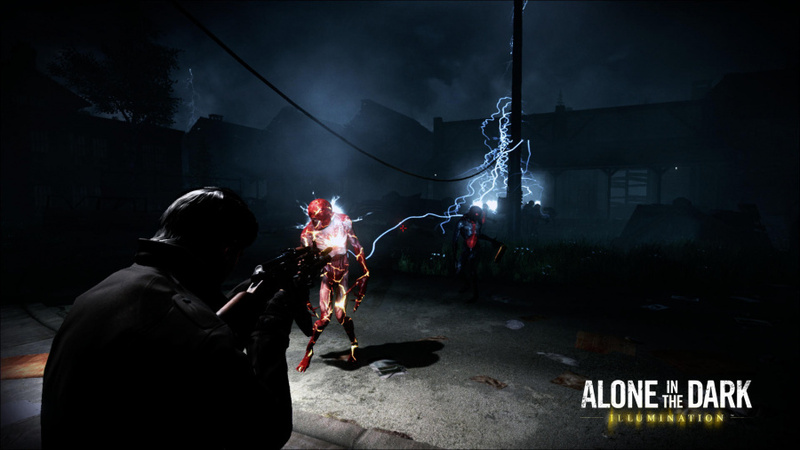 Alone In The Dark: Illumination is that title, and it's only coming to PC this Fall season; disappointing for console gamers. Unsurprisingly — considering the development newcomers Pure FPS are behind the game — it's a first-person title, with the accompanying press release confusing itself by saying it's in the "survival horror genre" before explaining that it's all about battling "through challenging missions and dynamic environments filled with blood-thirsty beasts in order to rid an abandoned town of its mysterious curse of Darkness". The emphasis is on saving additional characters that have their own unique weapons in "action-packed gameplay", making this sound like a 'shoot everything in the face' kind of game; it'll also include co-op play. Time will tell, though unlike the last entry in this series it's not confirmed for consoles at this time. You can see a teaser trailer below, so let us know what you think, and whether you're disappointed that it's PC-only at this stage. I'd say the reasoning for posting this on Nlife is extremely thin. But it at least interests me as a light PC gamer. This series was never that popular to begin with, it does had some really good survival horror elements in the old PC games but as the series continues on, it started to stray away from what made it a survival horror and like Resident Evil became nothing more than just another action shooter that happens to have mutated creatures in it. We're not missing anything here, it's much better to just play the two PC originals instead. @DualWielding Seems legit. I must've missed it. Sounds like another dark FPS masquerading as a horror game. I just pray that Nintendo localizes Fatal Frame 5 so that I can play a real horror game. Shooting? Action? Please correct me if I'm wrong, but wasn't Alone in the Dark more about tension-based horror and some symbolism, in a similar fashion to Silent Hill? I for one am happy to hear that it's a first person SHOOTER and not a bandwagon-jumping Amnesia / Outlast / unarmed-hidey-type horror game that there have been a lot of recently (namely on the PC indie scene). Personally, I can't go wrong with a non-zombie horror FPS...Call of Ctuhulu: Dark Corners of the Earth, Doom 3, Clive Barker's Undying and Jericho...lots of fun. @CaPPa You can do good horror with a FPS game, Doom 3 managed to do that. I have never played a more disturbing, more uneasy game in my life. And what was funny is that being armed to the teeth with weapons did not take away that fear of uneasiness. It's a damn shame so many people bash Doom 3. It was a great game, and did the whole survial horror thing better than any Resident Evil game. Only Eternal Darkness was Doom 3's peer when it came to just freaking me out. Alright one more title to add too the list of games not coming to the Wiiu.Damn the paper's full have to get another one fast. @Kaze_Memaryu Alone in the Dark was originally about Lovecraftian horror, which means the horrific unraveling discovery of an unknown evil (usually cosmic...thanks Wikipedia!). Like...oh crap, there's been a giant cavern full of ancient, not-of-this-world creatures under my house, and they're going to kill me. In games, it's actually been all over the place...for instance, in the original games, you did hilarious nonsense like fight pirates and dress up like Santa Claus. This time around, I just hope they have a story to tell or an interesting take on the genre, not just another me-too sequel. What are these articles? We're getting updates on games that were never even coming to a Nintendo console in the first place? While it had more than its fair share of problems (that opening car chase -__-) I really think Alone in the Dark did some amazing things. The dvd-like ability to skip ahead or jump back in the game was a nifty idea, and I really liked the weapons/item crafting and the music is one of my favorite soundtracks from last gen. I think one thing that really hampered it was its open-world nature as I think the linear-introductory building level was some inspired gameplay. Another game that won't come out on the Wii U a lot of articles today on this site seem to have the same theme. So a shoot everything that moves FPS shooter? I guess Pure doesn't understand the concept of survival horror that typically means not having the means to shoot everything that moves. With games like Doom 4 coming out on the PC, this title will likely be lost in the dust. The last installment of Alone in the Dark wasn't too bad at all, I rather enjoyed it (PS3 version). It just needed more tweaking to the controls/gameplay, but the PS3 version fixed several stuff like the horrible driving sequences. The movie killed much of franchise's popularity, as well as the 5th game of the series which came out in 2008. Still don't know know why Christian Slater signed up for that terrible movie. So......is Fatal Frame the only 3rd person survival horror game left?! Alone in the Dark The New Nightmare on the PS1, Dreamcast, and PS2 is a underrated classic. The reboot was bad with the exception of the PS3 version which fixed a lot of issues with the game. The fact that it's a FPS made me doubt it right away but when I read the words "action-packed gameplay" and even worse "co-op" my expectations dropped to zero.